Knowing the great humor creation system that is called Twitter, I looked there for some great lines. Here are my favorites. 9. @mergryphon: Let the People have SPICE! 8. @markjeffrey: But I wonder if cops will say my stillsuit is a ‘structure’ and arrest me? 6. @The_Stuart_H: 1% of all planets control the Spice. 5. @BrianPCombs (Yes, this is my own line): The corporatist Atriedes and Harkonnens both are tools of the Padishah Emperor Shaddam Corrino IV’s hegemony. 4. @arikia: It’s an interstellar movement now! 3. @napadude: End the tyranny of House Corrino and the Harkonnen spice monopoly. 2. 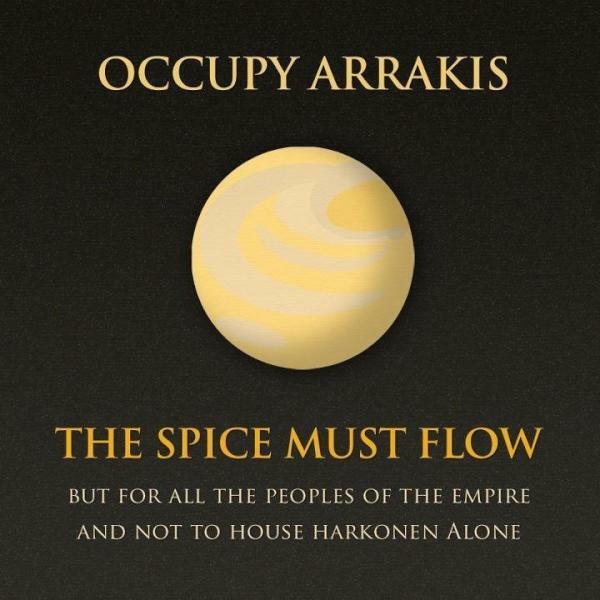 @nshaulis: it’s annoying to see all the Atreides supporters co-opt the #OccupyArrakis movement. The Fremen have been occupying for generations now. 1. @dampersand: House Corrino makes up 1% of the population, owns 99% of the universe’s spice. Just a disclaimer: I can’t say these people actually wrote their lines. They might well have coopted it from someone else. Hat Tip to my buddy Rick for being the first person I saw post this.